He lived a life that only a privileged few enjoy, and yet, perhaps, Billy Haggard’s true self was revealed when he was confined to a wheelchair, a quadriplegic for the final eight years of his life. Billy, a consummate horseman, started coming to Aiken in the 1960s and moved here permanently in 1973. When he died in January 2004 at the age of 76, he was mourned as one of Aiken’s last original Winter Colony gentlemen. William D. Haggard III was born in Nashville, Tennessee in 1927, to a family whose lineage included doctors who helped found the Vanderbilt University School of Medicine. His early days were not easy – his mother died when he was 4; his father, eight years later of a stroke. Billy was raised by his grandmother, who had the family chauffeur drive him to school each day. Little did she suspect that his classmates taunted him for his method of arrival and departure, but they did, mercilessly. Fortunately he discovered a surrogate father in Calvin Houghland, a successful businessman and sportsman from nearby Brentwood, Tenn., who had a passion for horses and was one of the founders of the Iroquois Steeplechase. 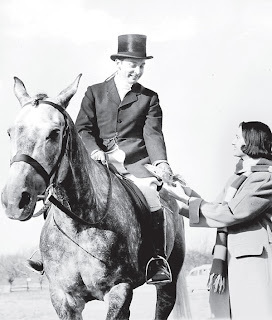 At Houghland’s Bright Hour Farm, Billy had his early lessons in horsemanship, and the foundation was laid for his lifelong love of foxhunting and steeplechase riding. After a stint in the U.S. Navy, Billy returned to Tennessee where he attended the University of the South. Upon graduation he took up the life of a true sportsman – he was one of those fortunate men who played three sports a day and then dined at a friend’s house, went to bed, and repeated it all the next day. When he was in his 20s, Billy dedicated himself to equestrian sports. He hunted, rode steeplechase races (he was the leading amateur rider in 1957) and was an enthusiastic three-day event rider, who was selected for the U. S. eventing team. On one particular weekend in late October of 1956, Billy found himself exactly where he loved to be, in a whirlwind of social activity with horses at the center of it all. 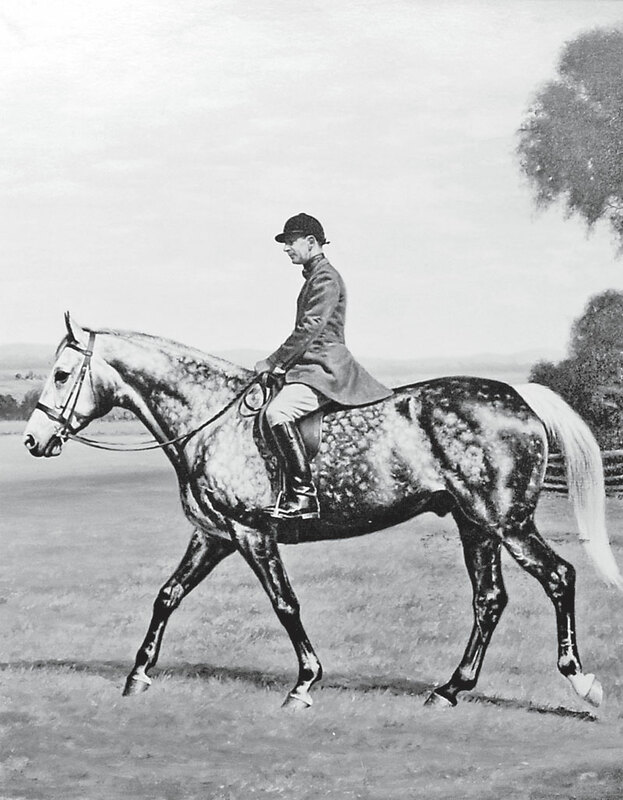 He and his grey gelding Trecla were at the hunter trials at Indian Hill Farm on the outskirts of Cincinnati. There was also the Camargo Hunt Ball to attend, which he did with a horse-crazy teenaged girl named Lefreda Williams. Lefreda’s grandfather was Oliver DeGray Vanderbilt, Master of the Camargo Hounds for many years. Life magazine covered the ball, the hunter trials and the ensuing social activities in a story entitled “Cincinnati Socialites follow Rigorous Ride with a Late Dance.” Billy was pictured jumping Trecla, one of the few horse photos in the multi-page spread. The weekend ended up being more than anything Billy could have dreamed, however: it was the weekend that he was introduced to a horse that would change his life, the big grey gelding Bold Minstrel. Bold Minstrel was 5 and he was owned by Lefreda Williams. For Billy, Bold Minstrel was the horse of a lifetime. The gelding was the epitome of versatility, excelling as a show hunter, foxhunter, event horse, and a show jumper. He earned medals in three Pan Am Games and one Olympic Games in two disciplines, a feat unmatched by any other horse. He was the perfect partner for Billy, who was never content with mastering one discipline. Billy rode Bold Minstrel in the Chicago Pan Am Games in 1959, sharing the team silver and finishing ninth individually in eventing. Four years later in Sao Paulo they placed sixth and helped the eventing team earn gold. Between their performances in the Pan Am Games, Billy and Bold Minstrel tackled the world of show hunters, earning the Reserve Championship in the conformation division at the National Horse Show in New York. When the team was picked for the 1964 Tokyo Olympics, Billy and Bold Minstrel were on the roster as alternates. Then, on the flight to Japan, Mike Plumb’s mount Markham had to be put down. Billy sent Bold Minstrel as a replacement. “I didn’t know Billy at that time, but he told me years later that when that phone call came he had his fingers crossed that team wanted him as well as Bold Minstrel,” says Janet. “And when they only wanted the horse he was gracious and humble enough to concede. He flew to Japan with his horse and cheered for Mike Plumb and the rest of the team.” The U.S. brought home the silver medal. After the Tokyo Olympics, Billy lent Bold Minstrel to his good friend, the show jumping legend William Steinkraus. 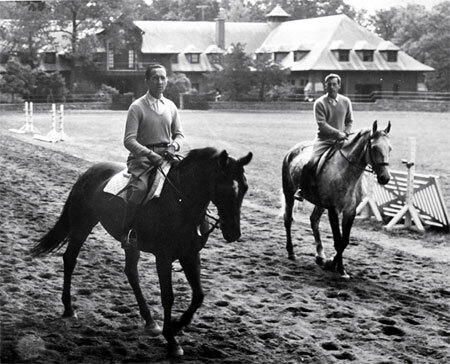 At the time, Billy and his second wife Holly Houghton were living in Far Hills, New Jersey, not far from the United States Equestrian Team headquarters in Gladstone. Steinkraus was working in New York as an editor for the Winchester Press and could usually only ride on weekends. Bold Minstrel was 12 at this point and for the next five years he competed with Steinkraus in numerous international show jumping events. The duo won more than a dozen major international competitions, including the Grand Prix of Cologne. In 1967 Bold Minstrel competed in his third Pan Am Games, this time in Winnipeg, earning a team silver in show jumping. That same year, Steinkraus and Bold Minstrel set a puissance record of 7’ 3” at the National Horse Show at Madison Square Garden. Later, after Billy had settled in Aiken, he had a shelf built in his library that was 7’3” and placed the puissance trophy on top of it. Billy’s next big horse was Main Spring. Although he had retired from competitive riding, Billy still loved to bring along young horses. Main Spring also developed into a talented jumper, and Billy lent him to Steinkraus who went on to win a team silver medal with him at the 1972 Olympics in Munich. In 1974, Frank Chapot got the ride, competing in England where he and Main Spring took the individual bronze medal at the World Championships at Hickstead and won the King George V Gold Cup. Billy’s life was not just about the horses, however. One of the reasons he loved Aiken so much was that he could play court tennis and go bird shooting. He had great pals here, including Jack Seabrook and Pete Bostwick. Carriage driving was another activity Billy learned once he had settled in Aiken. He would often be seen around town seated in a Meadowbrook cart and driving a grey horse named Good Day. He wouldn’t think twice about negotiating the drive-through of his local bank with a horse and carriage. Billy was also keen on another unique mode of transportation – his World War II Jeep that sounded as if it was still on military maneuvers. The only companion that would ride with him in the jeep was his Jack Russell, Idi Amin. When he was in his 60s, Billy began to miss competing his horses. As much as he loved shooting and court tennis, there was a void in his life. While many men his age were taking up golf, Billy took up show hunters. Under the tutelage of Danny Robertshaw, the Camden trainer, it wasn’t long before Billy was again in the show ring. Then, in February 1996, Billy was taking part in the Winter Equestrian Festival in Wellington, Fla. His horse went down in a freak accident in the warm-up ring. Billy, severely injured, was airlifted to St. Mary’s Hospital in West Palm Beach where the prognosis was bleak. Although he was given no more than a few days to live, Billy had other plans. There were no experts to call upon – this was one lesson he would have to do on his own. Although he was paralyzed from the neck down, he found that indomitable spirit deep within and rallied, much to the surprise of his doctors. After one month he was moved to Atlanta where he began a strenuous regime of therapy at the Sheppard Hospital Spinal Cord Injury Center. “Billy had a wheelchair that he could move by blowing into a tube – it’s nicknamed the sip and puff chair. It took a lot of work, but he never complained. He also had to learn to talk again – but his spirit never wavered. I was far more depressed than he ever was,” says Janet. After four weeks of rehab and therapy work, the doctors at Sheppard gave the go-ahead for Janet to bring Billy back home to Aiken. With the help of Janet and Joachim Beltran, who had been his groom, assistant and friend before the accident, Billy learned to navigate through the rooms of his 1850s home and eventually he could take himself on “strolls” around the neighborhood. During his lifetime Billy had amassed a large collection of sporting books – tomes that he had purchased on his various trips around the world. Many were leather-bound, first editions; others were several hundred years old. All were valuable. He worried about the future of his collection and he was insistent that the books be kept together. The books are now at the University of South Carolina’s Cooper Library in the Billy Haggard Sporting Books Collection.